Sorry it’s been a while. Not much to tell, I suppose. I have been shooting a bit, but the weather’s been lousy, so don’t have much. I’ll try to get some images downloaded to the computer so I can post something soon. This one is from late last year. Looking across the Kennicott Glacier towards some unnamed mountains. Still haven’t found me a wolverine, but I sure been looking. 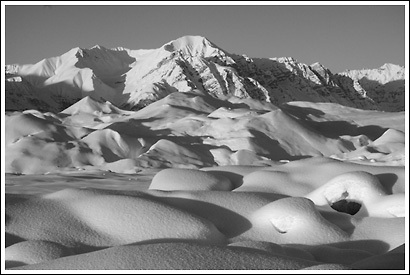 This entry was posted in Alaska, Landscapes, Winter, Wrangell - St. Elias National Park and tagged black and white, Glaciers, Kennicott Glacier, Landscapes, moraines, snow, Winter, Wrangell St. Elias on February 4, 2009 by Carl D.